Rubber balloon test method is an in-situ test conducted to determine field density of soils especially compacted soils. 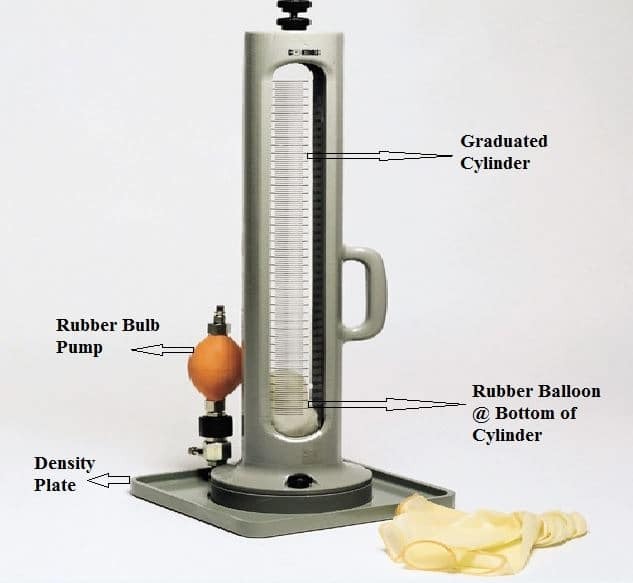 Apparatus required, test procedure and calculations of rubber balloon method are explained in this article. Rubber balloon test is a quick method and gives more accurate results compared to other in-situ methods. In this method, rubber balloons are used to determine the volume of excavated soil hole. Rubber balloon test is generally suitable for well-compacted soils. For very soft soils, that deform easily, rubber balloon method is not suitable. A balloon density meter is cylindrical in shape and consists of graduations on its wall. At the bottom of density meter a thin membrane (rubber balloon) is attached which will expand when water is pumped into it using control valve and rubber bulb arrangement. Rubber bulb pump also called as pressure and vacuum pump can be used to apply pressure and relieve pressure from rubber balloon. The test procedure of rubber balloon method to find field density of soil is as follows. Prepare a flat and smooth surface of the soil in the field where density needs to be found. Place the density plate on prepared surface and fix it using fasteners provided. The plate should not move while conducting a test. Now position the balloon density meter exactly on the hole provided in the density plate. Place the rubber bulb pump in the control valve and pump water into the balloon which is placed at the bottom of the density meter. Water is pumped until the water level in the density meter reached its lowest position. Note down the reading as initial volume (V1). After recording the initial volume, Invert the rubber bulb pump and pump the water back into its original position. Now remove the density meter and dig a hole using auger or trowel. The hole dug should be minimum 4 inches in diameter and 5 inches deep. The soil excavated from the hole should be collected completely in a moisture tight container. Its weight (W) should be noted and it is also used to determine the water content of the soil. Place the balloon density meter over the excavated hole and pump the water into the balloon using a rubber bulb pump. When the water level reached its lowest position, note the reading as the final volume (V2). 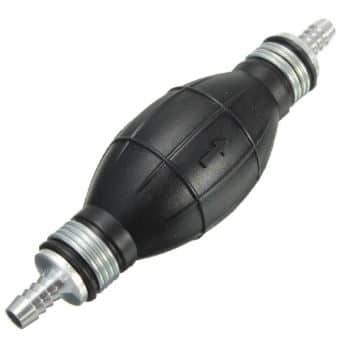 Now pump the water back into its original level using a rubber bulb pump with vacuum side connected to the control valve. Field Density of soil is = _________ N/m3.